Blast off into space and explore the galaxies with a constellation of illustrated poems about the sun, moon and stars, black holes and worm holes, asteroids and meteorites, and even weird alien life forms. 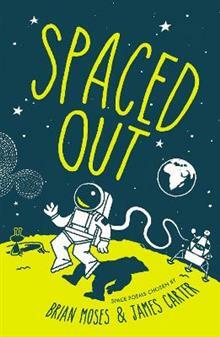 From shape poems and free verse to rhymes, kennings and haikus, Spaced Out... read full description below. Blast off into space and explore the galaxies with a constellation of illustrated poems about the sun, moon and stars, black holes and worm holes, asteroids and meteorites, and even weird alien life forms. From shape poems and free verse to rhymes, kennings and haikus, Spaced Out will take you on an intergalactic adventure. Join Brian Moses and James Carter and a wealth of new and established poets to discover your inner space cadet! This starry collection is the perfect way to get children interested in poetry. Brian Moses was a teacher for 13 years and has been a professional writer in schools, libraries, theatres and festivals since 1988. As one of Britain's favourite children's poets, he was commissioned by CBBC to write a poem for the Queen's 80th birthday which was then performed live on air. Brian is Reading Champion for the National Literacy Trust and Co-director of the Able Writers' Scheme he founded in 2002. James Carter is a prize-winning poet and educational writer. He travels all over the cosmos (well, Britain) with his guitar to give lively poetry performances and workshops with the express intention of motivating, inspiring and giving confidence to young writers. As a lifelong space cadet, James has discovered that poems are the best place to gather all of his daydreamy thoughts.